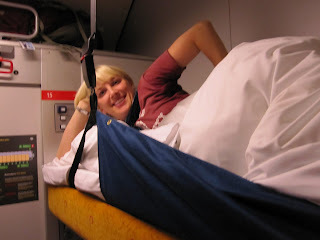 These are some photos from a sleeper car on the train. (This was after we left Bergen and travelled to Oslo for our last full day in Oslo and last night at Bjart's. The following morning we flew to Stockholm.) I'm using parentheticals because I think that this blog is a little weird, what with the back-in-times and the non-linear story telling. Not that it matters "what" night we rode the train from Bergen to Oslo, what matters is that night's terror was thinking that the train was going to completely leave the tracks and go careening down the mountain that we were obviously driving over due to the popping in my ears. And I was trying to sleep. It didn't help that the train designer people put in a seat belt in my bed. 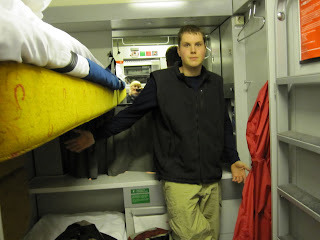 As you can clearly see from the photos, most places we slept didn't leave much room for male/female cousin privacy...dressing in the room was not an option. That night I slept in my jeans and t-shirt. I shimmied myself out of my bra after lights-out. Pretty romantic, though (not romantic like fall in love romantic, but romantic like traveling in a foreign country, sleeping on a train romantic). Might have been more amazing had I decided to just get that Xanax. Too lazy. Plus I got the Xanax for fear of flying, so I forget to take it other times when paralyzed by fear on boats or trains. Probably it would work in those cases as well, but the bottle clearly says, "take before fight" (sic). I thought that was pretty funny. Like, if I was just about to get in a fight, pausing to take my Xanax. So tough. Also, it's not Xanax, but Ativan. I learned that because the first time I went to get them, it was just before I left for China. The doctor gave me 30 of them, and I only take them when I fly, so I didn't run out of them until two and a half years later when I was about to leave for this trip (and that might only be because I told Nancy and Summer they could help themselves). A couple weeks before I left, I went in again to get a 'refill' and told the doctor that I was clearly addicted and could she please give me more this time. You know, for my friends. She didn't think that was funny, but gave me 90 anyways. So, I kept calling them Xanax, and she was like, "you were prescribed Ativan". So there you go. Guilty! I take Ativan! Right before a flight! If I take a Melatonin at the same time, I can sleep on a plane for like 10 hours. Once, I fell asleep in Los Angeles and woke up in Beijing. And if anybody ever messes with me, I'll take one, and then fight them. I like how we can see your reflection in the mirror. I think I can see Ross' refection in the lens of your camera, too. Just kidding. Aaron. lol. for next train trip in sleeper car: at bottom of mountain is lake, you live through the careening down the mountain only to be trapped in sleeper car slowly filling up with water.